The next decade. The author of the acclaimed "New York Times "bestseller "The Next 100 Years" now focuses his geopolitical forecasting acumen on the next decade and the imminent events and challenges that will test America and the world, specifically addressing the skills that will be required by the decade's leaders. The next ten years will be a time of massive transition. The wars in the Islamic world will be subsiding, and terrorism will become something we learn to live with. China will be encountering its crisis. We will be moving from a time when financial crises dominate the world to a time when labor shortages will begin to dominate. The new century will be taking shape in the next decade. 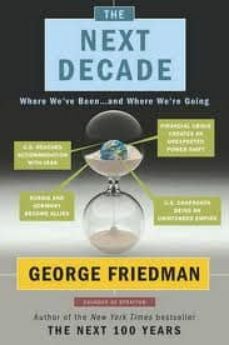 In "The Next Decade," George Friedman offers readers a pro-vocative and endlessly fascinating prognosis for the immedi-ate future. Using Machiavelli's "The Prince "as a model, Friedman focuses on the world's leaders--particularly the American president--and with his trusted geopolitical insight analyzes the complex chess game they will all have to play. The book also asks how to be a good president in a decade of extraordinary challenge, and puts the world's leaders under a microscope to explain how they will arrive at the decisions they will make--and the consequences these actions will have for us all.